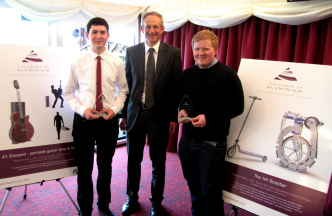 The scooter which clinched first prize was the brainchild of George Mabey, 22, a final year Engineering Product Design student. Runner-up was Product Design student Benjamin Hunt, 19, with his 'busking stand' guitar amp. Both collected their prizes at a ceremony at the Houses of Parliament. George Mabey, won £1,000 along with first-prize trophy. He says, "I was amazed at winning such a brilliant competition which I was proud to take part in as part of my final project here at London South Bank University. Having my work acknowledged at the awards ceremony and recognised by the industry is the icing on the cake and a great way to finish my time at University." Ben Hunt, who turned his love of the guitar into the university project, says: "I'm overwhelmed at my win and having my design acknowledged by ALFED. I've never won a competition like that and the really great feedback I've received confirms that product design is the right career choice for me. It was great getting to meet so many people in the industry at the awards ceremony, getting my name known and ultimately a brilliant way to top off my first year at University." "We are delighted that our students have won such prestigious awards in this national aluminium extrusion design competition. His folding A4 scooter design has now been patented and he is working on a fully-functioning prototype for exhibition in June. Ben is a first year BSc Product Design student and his guitar stand with integrated amplifier is an innovative concept aimed at a specific market segment.